Melvil Dewey (1851–1931) was an American librarian and self-declared reformer. He was a founding member of the American Library Association and can be credited with the promotion of card systems in libraries and business. He developed the ideas for his library classification system in 1873 while working at Amherst College library. He applied the classification to the books in that library, until in 1876 he had a first version of the classification. In 1876, he published the classification in pamphlet form with the title A Classification and Subject Index for Cataloguing and Arranging the Books and Pamphlets of a Library. He used the pamphlet, published in more than one version during the year, to solicit comments from other librarians. It is not known who received copies or how many commented as only one copy with comments has survived, that of Ernest Cushing Richardson. His classification system was mentioned in an article in the first issue of the Library Journal and in an article by Dewey in the Department of Education publication "Public Libraries in America" in 1876. In March 1876, he applied for, and received copyright on the first edition of the index. The edition was 44 pages in length, with 2,000 index entries, and was printed in 200 copies. The second edition of the Dewey Decimal system, published in 1885 with the title Decimal Classification and Relativ Index for arranging, cataloging, and indexing public and private libraries and for pamflets, clippings, notes, scrap books, index rerums, etc.,[notes 2] comprised 314 pages, with 10,000 index entries. Five hundred copies were produced. Editions 3–14, published between 1888 and 1942, used a variant of this same title. Dewey modified and expanded his system considerably for the second edition. In an introduction to that edition Dewey states that "nearly 100 persons hav [spelling of 'have' per English-language spelling reform, which Dewey championed] contributed criticisms and suggestions". In response to the needs of smaller libraries which were finding the expanded classification schedules difficult to use, in 1894, the first abridged edition of the Dewey Decimal system was produced. The abridged edition generally parallels the full edition, and has been developed for most full editions since that date. By popular request, in 1930, the Library of Congress began to print Dewey Classification numbers on nearly all of its cards, thus making the system immediately available to all libraries making use of the Library of Congress card sets. The growth of the classification to date had led to significant criticism from medium and large libraries which were too large to use the abridged edition but found the full classification overwhelming. Dewey had intended issuing the classification in three editions: the library edition, which would be the fullest edition; the bibliographic edition, in English and French, which was to be used for the organization of bibliographies rather than of books on the shelf; and the abridged edition. In 1933, the bibliographic edition became the Universal Decimal Classification, which left the library and abridged versions as the formal Dewey Decimal Classification editions. The 15th edition, edited by Milton Ferguson, implemented the growing concept of the "standard edition", designed for the majority of general libraries but not attempting to satisfy the needs of the very largest or of special libraries. It also reduced the size of the Dewey system by over half, from 1,900 to 700 pages. This revision was so radical that an advisory committee was formed right away for the 16th and 17th editions. The 16th and 17th editions, under the editorship of the Library of Congress, grew again to two volumes. However, by now, the Dewey Decimal system had established itself as a classification for general libraries, with the Library of Congress Classification having gained acceptance for large research libraries. Melvil Dewey edited the first three editions of the classification system and oversaw the revisions of all editions until his death in 1931. May Seymour became editor in 1891 and served until her death in 1921. She was followed by Dorcas Fellows, who was editor until her death in 1938. Constantin J. Mazney edited the 14th edition. Milton Ferguson functioned as editor from 1949 to 1951. The 16th edition in 1958 was edited under an agreement between the Library of Congress and Forest Press, with David Haykin as director. Editions 16–19 were edited by Benjamin A. Custer and the editor of edition 20 was John P. Comaromi. Joan Mitchell was editor until 2013, covering editions 21 to 23. In 2013 Michael Panzer of OCLC became Editor-in-Chief. The Dewey Editorial Program Manager since 2016 has been Dr. Rebecca Green. Dewey himself held copyright in editions 1 to 6 (1876–1919). Copyright in editions 7–10 was held by the publisher, The Library Bureau. On the death of May Seymour, Dewey conveyed the "copyrights and control of all editions" to the Lake Placid Club Educational Foundation, a non-profit chartered in 1922. The Online Computer Library Center (OCLC) of Dublin, Ohio, US, acquired the trademark and copyrights associated with the Dewey Decimal Classification system when it bought Forest Press in 1988. In 2003 the Dewey Decimal Classification came to the attention of the U.S. press when OCLC sued the Library Hotel for trademark infringement for using the classification system as the hotel theme. The case was settled shortly thereafter. The OCLC has maintained the classification since 1988, and also publishes new editions of the system. The editorial staff responsible for updates is based partly at the Library of Congress and partly at OCLC. Their work is reviewed by the Decimal Classification Editorial Policy Committee, a ten-member international board which meets twice each year. The four-volume unabridged edition was published approximately every six years, with the last edition (DDC 23) published in mid-2011. In 2017 the editorial staff announced that the English edition of DDC will no longer be printed, in favor of using the frequently updated WebDewey. An experimental version of Dewey in RDF was previously available at dewey.info beginning in 2009, but has not been available since 2015. In addition to the full version, a single-volume abridged edition designed for libraries with 20,000 titles or fewer has been made available since 1895. The last printed English abridged edition, Abridged Edition 15, was published in early 2012. The classification was originally enumerative, meaning that it listed all of the classes explicitly in the schedules. Over time it added some aspects of a faceted classification scheme, allowing classifiers to construct a number by combining a class number for a topic with an entry from a separate table. Tables cover commonly-used elements such as geographical and temporal aspects, language, and bibliographic forms. For example, a class number could be constructed using 330 for economics + .9 for geographic treatment + .04 for Europe to create the class 330.94 European economy. Or one could combine the class 973 (for the United States) + .05 (for periodical publications on the topic) to arrive at the number 973.05 for periodicals concerning the United States generally. The classification also makes use of mnemonics in some areas, such that the number 5 represents the country Italy in classification numbers like 945 (history of Italy), 450 (Italian language), 195 (Italian philosophy). The combination of faceting and mnemonics makes the classification synthetic in nature, with meaning built into parts of the classification number. 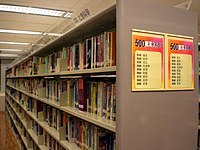 The Dewey Decimal Classification has a number for all subjects, including fiction, although many libraries maintain a separate fiction section shelved by alphabetical order of the author's surname. Each assigned number consists of two parts: a class number (from the Dewey system) and a book number, which "prevents confusion of different books on the same subject". A common form of the book number is called a Cutter number, which represents the author and distinguishes the book from other books on the same topic. The Relative Index (or, as Dewey spelled it, "Relativ Index") is an alphabetical index to the classification, for use both by classifiers but also by library users when seeking books by topic. The index was "relative" because the index entries pointed to the class numbers, not to the page numbers of the printed classification schedule. In this way, the Dewey Decimal Classification itself had the same relative positioning as the library shelf and could be used either as an entry point to the classification, by catalogers, or as an index to the Dewey-classed library itself. In 1932 topics relating to homosexuality were first added to the system under 132 (mental derangements) and 159.9 (abnormal psychology). In 1952 homosexuality was also included under 301.424 (the study of sexes in society). In 1989 it was added to 363.49 (social problems), a classification that continues in the current edition. In 1996 homosexuality was added to 306.7 (sexual relations) which remains the preferred location in the current edition, although books can also be found under 616.8583 (sexual practices viewed as medical disorders), however the official direction states that "Use 616.8583 for homosexuality only when the work treats homosexuality as a medical disorder, or focuses on arguing against the views of those who consider homosexuality to be a medical disorder. ... If in doubt, prefer a number other than 616.8583." The subject of religion has been very heavily favored toward Christianity, with nearly the whole 200s being used for Christianity, and only the 290s being used for all other religions, of which there are thousands. While Christianity is a popular religion with 33% of the world subscribing to it, Islam has a very large following as well and only has DDC 297 to work with. The entire 200 section has been largely the same since DDC 1, and it would likely be a large undertaking to completely rewrite this section, particularly for individual libraries to adapt to. Despite topics such as Islam only having a single digit associated with it, there is adequate room in that number, due to the ability to expand beyond the decimal point. The topics of women have had bias in them as well as far as the classification scheme, but have been easier to edit than the religion schema, and changes have been made. Some changes that have been made have been on what items are side by side numerically. Those items that are side by side are related to each other in the classification scheme. For example, the topic on women used to be next to etiquette. Those two terms being next to each other would associate women with etiquette rather than etiquette being gender neutral. This was changed in DDC version 17. ^ Chapter 17 in Joudrey, Daniel N.; Taylor, Arlene G.; Miller, David P. (2015). Introduction to Cataloging and Classification (11th ed.). Santa Barbara, CA: Libraries Unlimited/ABC-CLIO. ISBN 978-1-59884-856-4. ^ Dewey decimal classification and relative index (1971). Internet Archive. 1971. Retrieved 14 December 2013. ^ Comaromi (1976), p. 171. ^ Comaromi (1976), p. 218. ^ Comaromi (1976), p. 315. ^ Comaromi (1976), pp. 297–313. ^ Comaromi (1976), p. 321. ^ Comaromi (1976), p. 376. ^ COMAROMI, JOHN P. (1975). The Historical Development of The Dewey Decimal Classification System. Graduate School of Library Science. University of Illinois at Urbana-Champaign. hdl:2142/1778. ISBN 9780878450442. ^ Trotter, Ross (6 July 1995). "Electronic Dewey: The CD-ROM Version of the Dewey Decimal Classification". Cataloging & Classification Quarterly. 19 (3–4): 213–234. doi:10.1300/J104v19n03_17. Retrieved 15 December 2013. ^ Majumder, Apurba Jyoti; Gautam Sarma. "Webdewey: The Dewey Decimal Classification in The Web" (PDF). INFLIBNET Centre, Ahmedabad, Planner 2007 [held at Gauhati University]. Retrieved 15 December 2013. ^ "Announcing Dr. Rebecca Green as new Dewey Editorial Program Manager". 025.431: The Dewey blog. Retrieved 2018-05-22. ^ Dewey, Melvil (1922). Decimal classification and relative index for libraries and personal use. Lake Placid Club, N.Y.: Forest Press. p. 2. OCLC 1367992. ^ "Dewey Print Editions". 025.431: The Dewey blog. Retrieved 2018-05-22. ^ "Dewey Decimal Classification (DDC) - the Datahub". old.datahub.io. Retrieved 2018-05-22. ^ "Change to Dewey Web Services | OCLC Developer Network". www.oclc.org. 2015-06-15. Retrieved 2018-05-22. ^ a b Sullivan, Doreen. "A brief history of homophobia in Dewey decimal classification". Overland. Retrieved 19 December 2017. ^ "DDC - 200 - Religion". bpeck.com. Retrieved 2018-03-20. ^ "World's Muslim Population Will Surpass Christians This Century, Pew Says". NPR.org. Retrieved 2018-03-20. ^ Olson, Hope (2002). The Power to Name. Edmonton, Alberta, Canada: Springer-Science+Business Medida, B.V. p. 22. ISBN 9789048160846. ^ a b c Olson 2002, p. 8.